The only change was to the Note, which is shown below. NOTE: The counselor for Scuba BSA must hold an instructor rating and be in current teaching status with PADI, NAUI, SSI or RSTC member organization another member of the RSTC in accordance with BSA scuba policies. Instruction must meet the minimum training standards for introductory scuba experiences set by the RSTC and guidelines provided in the Scuba BSA Brochure, No. 13-971. 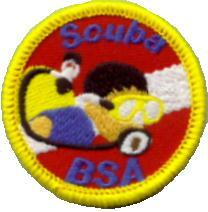 BSA scuba policies are provided in that brochure and also in the Guide to Safe Scouting. Although Scuba BSA is similar to introductory scuba experiences offered by various RSTC member organizations, those programs are not substitutes for Scuba BSA. All requirements must be completed as stated on the application form. The counselor may not omit, vary, or add requirements. In particular, Scuba BSA has a prerequisite swimming requirement, is only available to youth and adults registered in the Scouts BSA or Venturing programs (minimum age around 10 1/2), and does not include the option of an open-water dive.